The Russian government has decided to retain the funded pension system – part of the pension that is formed by contributions from the employer and investment. The money will be used to finance infrastructure projects. However, experts warn that the quality of management of pension funds should be dramatically improved. As business daily Vedomosti reported back on April 23, with tight restrictions still in place on obtaining foreign credit, the Russian government has decided to preserve the funded pension system, with a view to using the money to finance infrastructure projects. The funded part of the pension is formed by regular deductions from wages, which are then invested by a non-state pension fund or the state-owned Vnesheconombank. Anybody opening a pension fund can choose whether to invest in a state or private pension. According to Prime Minister Dmitry Medvedev, making the announcement on April 22, pension funds are a "source of the long-term money to support investment under the conditions of international financial markets being closed for Russia." As Finance Minister Anton Siluanov said at a session of the government, from the beginning of 2015 pensions could be used to finance private projects, including the country’s largest LNG project – the construction of the Yamal LNG plant in northern Siberia. 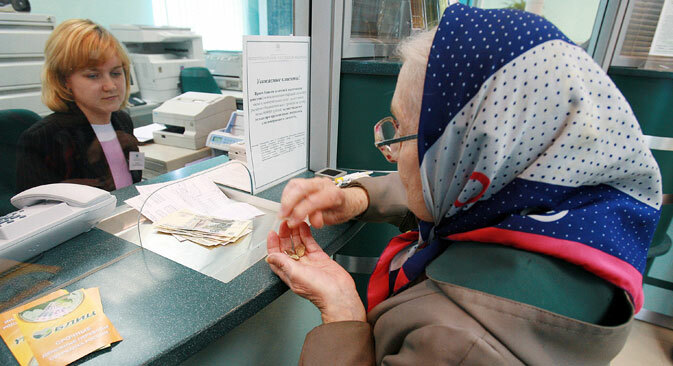 "Throughout the world, pension money is the most important source of long-term investments in the economy, and under certain conditions it will also be so in Russia," said Yelena Tetyunina, deputy CEO of the Sberbank non-state pension fund. According to Tetyunina, the aim of the pension reform includes the creation of a source of "long-term money" for the economy. According to Siluanov, the government is ready to alter the declaration of non-state pension funds in order to finance long-term projects, so that this money can be invested in stocks, bonds and other instruments for economic development. According to the Ministry of Finance, this will bring up to 350-400 billion rubles ($6.8-7.8 billion) into capital markets every year as a result. "Unlike conventional deposits, the life and investment term of pension money is at least 25 years on average. Therefore pension savings can be used to finance infrastructure projects," said Alexander Safonov, a vice-rector of the Russian Presidential Academy of National Economy and Public Administration. According to him, investment in the project of reconstructing the BAM-2 railway line from the Far East to the European part of Russia is now being discussed. This will increase the capacity of rail transportation in the direction of China, South Korea and Japan. In its turn, Russian oil giant Rosneft sees pension funds as a source of credit for the development of the Arctic shelf, said Safonov. "The closing of the Western markets of financing and refinancing was the catalyst for attracting funds from domestic investors," said Valery Vinogradov, adviser to the president of the National Association of Non-State Pension Funds and head of the Center for Pension Market Information Communication. According toVinogradov, pension fund savings and reserves exceed 4 trillion rubles ($77.9 billion) in total, which is comparable with the volume of Russia's sovereign wealth fund. According to Safronov, there are currently shortcomings in the mechanism for distributing pension funds to long-term projects. In particular, non-state pension funds are prohibited from investing in innovation projects. "At the same time, in the United States and other developed countries, funded pension insurance is the main source for the development of such projects, which provide the greatest return in the period from five to 10 years," he said. Moreover, as follows from the results of inspections carried out by the Central Bank, the level of management of non-state funds is not always professional. In one particular case, one fund failed to take into account 5 million of its clients due to an error in book-keeping. According to the proposals by the Ministry of Finance, it will be possible to invest pension funds in infrastructure through special infrastructure bonds. However, according to Tetyuneva, the reliability of such investments will depend on the particular issuer and project. As noted by Valery Vinogradov, investments in infrastructure projects involve a serious examination. "This money cannot help but return, because it's someone's future pensions," he said.